Rarely has the annual session of the UN General Assembly attracted public interest as it has this year, when attention is focused on the prospect of a Palestinian declaration of independence or application for UN membership. In this post, I would like to discuss the significance of such steps and their potential consequences. There is at least a core territory -- the Gaza Strip and areas within the West Bank -- in which a government exercises effective control over a population. (map credit) Moreover, any deficiencies in the effectiveness of government are likely to be mitigated by the right to self-determination of the Palestinian people, which has long been recognized internationally, including by Israel, the main opponent to Palestinian statehood at this time. As I argued in an article published last year, what precludes the Palestinian Authority (the political entity operating in the West Bank) from being considered a state is merely the fact that it does not claim to be one. Consequently, if the Palestinian Authority does declare the establishment of a state of Palestine, recognition of such a state would, in principle, be neither premature nor in violation of any international legal norm. Recognition of statehood is a separate matter from admission to the United Nations. Recognition of new states is the prerogative of states. Nonetheless, admission of an entity as a member state of the United Nations creates a strong presumption in favor of that entity's statehood. Similarly, a resolution which ostensibly recognizes a new state can be regarded as the collection of numerous individual acts of recognition by states voting in favor of the resolution. It is in this way that UN processes and recognition of statehood may be linked. Admission to membership in the UN requires a two-third majority decision by the General Assembly, upon a recommendation by the Security Council. While the former is easy for the Palestinians to secure, approval by the Security Council, which is a prerequisite, is expected to fail due to a US veto. ► Adopt a decision welcoming the existence of the new state. Within the United Nations this will be symbolic gesture only; but it may suffice as a cue for the specialized agencies of the United Nations to admit Palestine as a member. 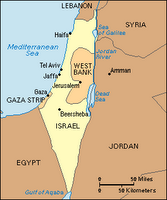 ► Grant Palestine a non-member state observer status. The practical implications of this route would be minimal, beyond the implied recognition of statehood, since the Palestine Liberation Organization (under the name of Palestine) already enjoys a unique and upgraded observer status that is very similar to that of a state. ► Circumvent a Security Council veto by adopting a resolution under the Uniting for Peace procedure. Adopted by the General Assembly to overcome Security Council paralysis due to repeated vetoes, this provides that where the Security Council fails to exercise its primary responsibility for the maintenance of international peace and security because of lack of unanimity of the permanent members, the General Assembly shall seize itself of the matter. The propriety of this route is questionable: Admission of new members hardly falls within the Security Council's primary responsibility, nor does a one-off veto justify its use. Moreover, in its 1950 Advisory Opinion on Competence of the General Assembly for the Admission of a State to the United Nations, the International Court of Justice expressly stated that ‘admission of a State to membership in the United Nations… cannot be effected by a decision of the General Assembly when the Security Council has made no recommendation for admission’. Prima facie, this precludes resort to the Uniting for Peace procedure. The General Assembly, however, has never taken much notice of the limitations of the procedure, particularly not when it concerns the Israeli-Palestinian conflict. Moreover, the 1950 advisory opinion was premised, among other, on the fact that ‘nowhere has the General Assembly received the power to change, to the point of reversing, the meaning of a vote of the Security Council’. If one accepts the power of the General Assembly to follow the Uniting for Peace procedure, adopted less than a year after the publication of the advisory opinion, the latter can no longer be regarded as entirely precluding substitution of a Security Council veto by a General Assembly resolution recommending the admission of Palestine. ► First, given the overwhelming consensus that the West Bank is under Israeli occupation, and the less widespread but still prevalent view that the Gaza Strip is also occupied, for a claim of effective government over territory to be credible, the Palestinians must indicate some core territory where they exercise effective control to the exclusion of Israel. They will have to concede that at least that part of the territory they claim is not occupied. Such concession is readily acceptable with respect to the Gaza Strip (although the Palestinian Authority might be hesitant to rely on Hamas to substantiate its status) or with respect to areas within the West Bank. As noted earlier, I believe this proposition to be acceptable as regards statehood. It is discussed here in the context of its implications with respect to occupation. ► Second, the Palestinians will need to indicate any territory claimed by them as sovereign in which they do not exercise effective control, otherwise Palestine may be recognized in relation only to those areas which are under effective Palestinian control at the time of declaration, i.e. at most the West Bank and Gaza Strip (but not Jerusalem!). This would make any further territorial demand a matter for bilateral political negotiations with Israel, rather than a demand for the realization of a legal entitlement. It is therefore likely that any declaration of statehood will include some reference to a wide, as-yet unfulfilled territorial entitlement. 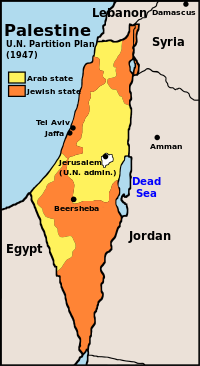 However, a claim of sovereignty over territory beyond the West Bank and Gaza Strip (for example, over mandatory Palestine or over the Arab state's share under the 1947 partition plan (UN Resolution 181 (II)) (depicted at left (map credit)) would be more difficult for states to accept, because it would infringe on Israel's territorial integrity. The only exception would be with respect to Jerusalem, where Israeli sovereignty is contested, at least with respect to the Eastern part of the city. The legal consequences of Palestinian statehood might not be as earth-shattering as might be expected. ► Statehood would put paid to any doubt as to the law governing the relations between Israel and the Palestinians. There will no longer be any doubt that territory remaining under Israeli effective control is occupied for the purpose of the Fourth Geneva Convention; nor, on the other hand, will there be doubt that the Palestinians are bound by the prohibition on the use of force, or that a right to self-defence accrues in the relations between them and Israel. ► Characterization of the conflict between Israel and the Palestinian as international will also cease to be an issue. Yet the significance of this clarity should not be overstated, given that the distinctions between international and non-international conflicts are diminishing, and the prevailing tendency to classify the conflict as international, illustrated in the Palmer Report, para 73, as well as in Israeli jurisprudence. For almost three years, the ICC Prosecutor has been faced with a declaration by the Palestinian Authority, purporting to grant the ICC jurisdiction over crimes allegedly committed in the 'territory of Palestine' since 2002. The coming into existence of a state of Palestine will relieve the Prosecutor of the need to determine the admissibility of this declaration, since a state of Palestine would undoubtedly be entitled to grant the ICC jurisdiction with respect to crimes allegedly committed on its territory, either ad hoc or by acceding to the ICC Statute. Such jurisdiction can operate with retroactive effect (Articles 11(2) and 12(3) of the Rome Statute of the ICC), but it probably cannot extend to the period prior to the state’s existence. Even prospectively, ICC jurisdiction may have far-reaching implications for Israel: in addition to exposing members of the Israeli military forces to investigation and prosecution for acts carried out in the West Bank and Gaza Strip, it will bring to the fore the entire settlement project, which prima facie constitutes a war crime under the ICC Statute, implicating not only the military but tens of thousands of civilians. There are numerous obstacles to prosecuting Israeli citizens for their involvement in the project, such as the non-customary character of the Statute's provision, the absence of required mens rea and more; but the very dealing with these questions may extract a high toll from Israel. ► A final consequence to consider is the status of the Interim Agreement, signed by Israel and the PLO in 1995, which prohibits unilateral measures to change the status of the West Bank and Gaza Strip. Although the Agreement was meant to expire in 1999, neither side has publicly denounced it, and both sides rely on it occasionally. A Palestinian declaration of stat ehood may be a violation of the Agreement (the doubt being that the Agreement bi nds the PLO rather than the Palestinian Authority, although the latter entity is itself a product of the Agreement), but it would not detract from the validity of the Palestinian statehood. There are those who point out that a declaration of statehood would entitle Israel to declare the Agreement terminated on the ground that there has been a material breach under Article 60 of the Vienna Convention on the Law of Treaties, thereby exempting it from obligations that it fulfills at present, such as the transfer of funds to the PA. (See here.) Israel would nonetheless remain bound by its obligations under the laws of armed conflict and international human rights law. The legal ramifications of the anticipated steps by the Palestinians appear to be of limited scope. Palestinian statehood will not cause a legal earthquake. In contrast, commentators warn of the negative impact that such steps might have on the prospects of bringing the parties back to productive negotiations. The wisdom of any future action should therefore be assessed in light of these considerations, no less than in light of their legal consequences.